Written with a conversational style, this concise reference informs readers about the types of academic positions available, how colleges and universities operate, how to go about obtaining a position, and how to succeed in academia. "Getting Started as a Pharmacy Faculty Member sets realistic expectations for the challenges and rewards of an academic career in pharmacy. I would highly recommend this book to anyone considering a career as a pharmacy faculty member, or anyone mentoring someone who is considering such a career." "This is a unique book because it provides insights on how to approach the beginning stages of a career in academia. 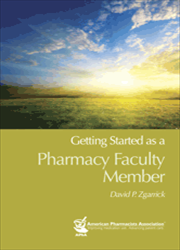 With its practical information on how to get started, I would highly recommend it to anyone considering a position as a pharmacy faculty member. Pharmacists in the early years of their career can also benefit from the advice and tips, which focus on finding the path that is right for them to grow and succeed in a role that can be challenging, yet has infinite rewards." Is an Academic Career a Good Fit for You?